Yes, we have a 30 Day FREE TRIAL! How is Reduce the Lag Different? Sign up now or try FREE for 30 Days! Sick of lag? Just want to get on with the game? We bounce your game data via our network of servers before finally sending it onto the real game servers. The result is more stable network communications for your game, with up to a half in latency. Install RTL and just play, lag free! No programs to run every time, no usernames and passwords, no game crashes and no overloaded servers. Once RTL is installed you never need to think about it again. Just open World of Warcraft (Wow), Aion, Tibia, Star Wars: The Old Republic (SWTOR) or Tera, and play lag free. Both the RTL client and our server software has been custom written for the task. Utilizing geodns server allocation with automatic load balancing and failover of over 40 servers you will never have to worry about which server has the best lag and least load for you. Why is low latency important? Online games are designed to be fun, entertaining, and to look great! Unfortunately the net code is often given a back seat and the designers simply don’t have as much experience with online networks. The effects of this are not normally noticed because the game is written, tested, and played by gamers usually less than a few hours away. Every spell they cast, every action they take, every little thing they do gets to the game servers faster than 1/10th the blink of an eye. For players further away this delay can become a full half second! 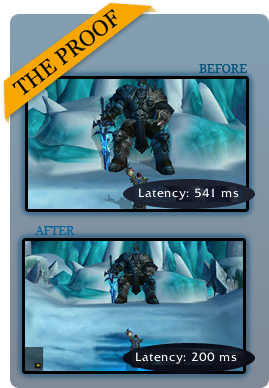 By reducing your latency with Reduce The Lag (RTL) you can even the odds. Every action gets to the game servers almost twice as quick! Attacking, Casting, Moving, Jumping, Looting, Dueling … every action! With a heap of servers, private networks and employees proficient in network programming at our disposal, we decided we should do something about it. We are confident you will be very impressed with our solution. Jan 29 2019 – RTL v3.1.60 is available for download. We released this version with some tweaks to help prevent security software from freaking out about it. Please let us know if you experience any difficulties. Jan 21 2019 – RTL suddenly stopped working? Suggest checking that your security or firewall software hasn’t decided to delete RTL’s files from your computer. We’ve had three users report that windows defender has been silently deleting files without notifying them. Nov 8 2018 – Maple Story 2 Region Unlock profiles have been added to RTL. You can enable it in our website’s members area. Don’t forget to make sure the Nexon Launcher is closed before enabling this feature, you can find it hidden in your system tray. You may have to do a password reset because of the sudden change in login location. And you will find the launcher connects considerably slower because RTL is now handling all of its (many!) connections. Oct 29 2018 – We’ve made a small change to our config for Aion to help prevent issues with the in game store. Reinstall RTL, restart RTL or just click save on our members page to force RTL to download the latest configuration. Also, RTL v3.1.59’s installer has been updated to double and triple check the permissions are correct when RTL is installed. If you find that RTL is suddenly not working, please uninstall RTL, download RTL again from our members area, and install it again. Please contact us if you still experience any issues. Tip: you can check for recent account activity at the bottom of our members homepage. Oct 26 2018 – Maple Story 2 has been added to Reduce The Lag. Please select your region after enabling it in our members area. Please let us know if you experience any difficulties.